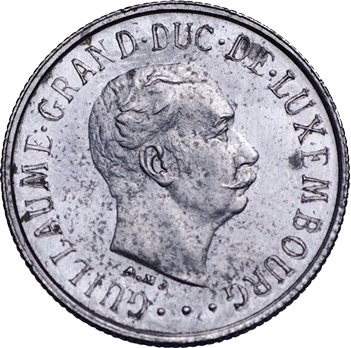 Portrait of Grand Duke Guillaume de Nassau, surrounded by legend and three points at the bottom. Signature of the engraver under the portrait. 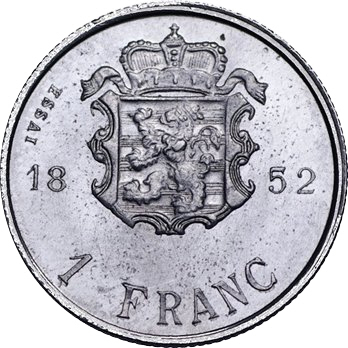 Small crowned Luxembourgish coat of arms with a lion rampant to the left and a forked tail on a field of ten pieces, placed to the left of it the word ESSAI and splitting the mint year. Facial value at the bottom. 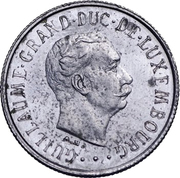 It was a very rare trial strike, minted with the year 1852, but with the effigy of Grand Duke Guillaume de Nassau, who ruled from 1905 to 1912, which was struck after 1945 at the mint in Brussels. © Photo from the sale of January 9, 2010, Auc. 3 l. 353 and used with the kind agreement of Mr. Joselito Eeckhout.